Do you need to hire a photography studio in Halifax? Infinitus Studios is situated within a 200 year-old working textile mill. Our facilities include an adaptable 100 square metre (1000 sq ft) studio space, a 30 square metre hair & make-up studio with lounge area. We also have a spacious fully working kitchen and dining space for any visitors, adjacent to the studio space. Located in Bailiff Bridge, Brighouse, we're just outside Halifax. So if you need a photography studio to hire in Halifax, we're on your doorstep. 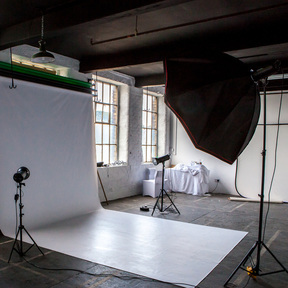 With high ceilings throughout, painted brickwork & period victorian mill original feature windows our space offers multiple shoot facility, easily accommodating 3 simultaneous shoots, should you require. Based on the 4th floor, our studio is accessible by passenger lift as well as having access to a cargo lift for load-in should you need to bring larger items or props for your shoot. The studio is open plan and customisable to a range of different themes with superb production qualities as well as extraordinary natural light. Our studio is equipped with a range of back drops and settings as well as several props to use should you wish. For a full inventory on the equipment we carry please click here. As well as hiring the studio, you can also, should you wish, book one of our hair & make-up stylists , models, technical staff or photographers should you need. Our Studio is available and accessible 24 hours, 7 days a week.